Aloe vera is a succulent, or cactus-like plant from which aloe vera oil and other similar products are produced. Aloe vera oil is made by infusion, much the same way as herbal tea. The leaves are soaked or steeped in a liquid, in this case, a vegetable oil, usually soybean oil. Different manufacturers use different types of oil. As you can see, aloe vera oil is not directly produced by the plant. The leaves do contain a type of gel. Commercial aloe producers take this gel and evaporate it into aloin, a crystallized substance which can be used in hundreds of products. The biggest use of aloe vera oil is in skin creams and lotions. Today there are quite literally thousands of aloe vera cosmetic products on the market and they all contain an extract from aloe. Most of the aloe vera grown for commercial use comes from the Caribbean, Florida and Texas. The FDA has approved aloe for external use for the treatment of minor skin burns and for skin rejuvenation. One of the things that makes aloe vera so effective as a topical skin treatment is that it heals the skin from the inside out. This makes it particularly effective at treating wounds. Among the many uses of aloe vera are the treatment of burns, blisters, radiation dermatitis, frostbite, psoriasis, eczema, itchiness, dryness, and other skin conditions. Because aloe vera has antibacterial properties, it is able to not only help with healing skin but prevent the occurrence of infections as well. Aloe vera, in any form including aloe vera oil is not approved by the FDA for any type of internal use. That’s not to say that the substance has never been used internally, just that no results have had strong enough documentation of success for approval. Use of aloe vera both as a topical and internal treatment goes back to before Christ and it was written about for the first time in the first century. As an alternative treatment, aloe vera has been used for centuries to treat many conditions. One of these is clearing out the digestive tract and the relief of constipation. In Indian medicine, aloe vera has been used to treat asthma, musculoskeletal disorders, ophthalmologic disorders, several types of hepatitis, menstrual problems, as an aphrodisiac, for fever, vomiting, bronchitis, and spleen enlargement. The leaves from which aloe vera oil is produced also have other beneficial constituents such as fatty acids, which can help with heart health. Aloe vera contains enzymes, such as oxidase, alkaline phosphatase, amylase, lipase, catalase and the essential amino acids leucine, valine, lysine, phenylalanine, isoleucine and threonine. These are all needed in order for muscles, bones, organs and immune system to function correctly. Aloe vera contains vitamins and minerals that benefit human health. These include folic acid, vitamins B1, B2, B6, E, C, beta carotene, calcium, chromium, magnesium, copper, zinc, manganese and sodium, among others. Aloe vera has been taken internally in research studies but thus far results are not conclusive enough that aloe vera can be recommended to treat any diseases. Reports suggest that it can stimulate the immune system and may be able to curtail blood supply to tumors and also help in liver cancer by stopping carcinogenic substances from entering the liver. There will much more research before there can be any conclusive facts about aloe vera and how it affects various cancers. 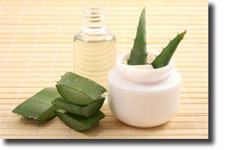 Check with your doctor about the use of aloe vera oil for the treatment of injuries and skin conditions. If you plan to take aloe vera internally, discuss that with your doctor as well, as certain medications combined with aloe vera may have adverse effects. Also discuss use of aloe vera with an herbalist so that the correct dose will be used.